I might once have described my memory as "an iron-clad lockbox" but taking care of a toddler has turned my brain into a swamp. So it was hardly surprising that I was out and about for several hours last Thursday before it dawned on me that it was St. Patrick's Day. I had vaguely registered that a lot of people seemed to be wearing green but I didn't think much of it. It was only after I noticed that grinning leprechauns were leering at me from behind random corners that I finally put it together that it must be St. Patrick's Day. It was shortly after this "aha moment" that I spotted these big, gorgeous hunks of Irish soda bread lying around, flaunting their good looks in a local bakery. As I was drooling over them, I realized that I actually had no idea what Irish soda bread was... I decided to look it up when I got home and (minor miracle!) also managed to remember to do it next time I was in front of a computer. Turns out that it's called soda bread for, you guessed it, bicarbonate of soda, which is used to leaven the bread. 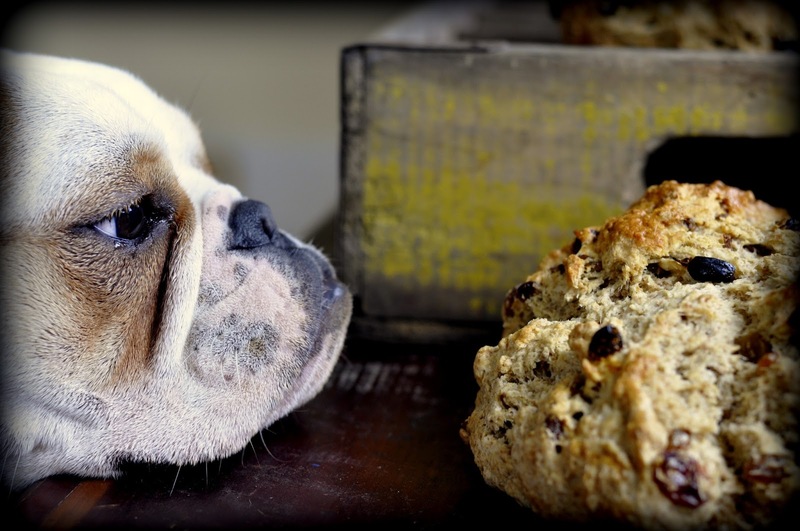 My search turned up lots of variations on traditional Irish soda bread which is made with flour, baking soda, buttermilk and salt -- nothing more nor less. 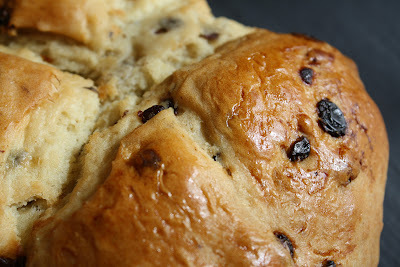 I was particularly drawn to the recipes for sweet Irish soda bread with raisins since "ray-ray" constitute one of my son, Will's main food groups these days. He seems to have a hollow leg when it comes to "nature's candy." And since that carton of organic buttermilk sitting in the fridge was not getting any younger, I figured, why not give it a shot? It did not take long to mix up a batch of dough and get it ready to bake. The caraway seeds gave me pause for a moment but then I tossed them in and I sure am glad I did. The combination of their uniquely tangy, almost floral flavor and the straightforward fruity sweetness of the raisins is not to be missed. Whatever the reason(s), I think it makes the baked loaf look even prettier. I busted out the bread while it was still warm and served chunks to our maple syrup-making guests, Daniel and Rio, and to Rahm and Will. It went over quite well. As predicted, Will mostly picked the raisins out of his piece and ate them but I think I saw him take a few bites of actual bread, too. Next year, I hope to remember to make this bread BEFORE St. Patrick's Day. But I'm not putting any money on it - a swamp is a swamp. 1. With the oven rack in the center, preheat the oven to 375 F. Line a baking sheet with a Silpat or parchment paper and set aside. 2. In a large bowl, whisk together the flour, sugar, salt and baking powder. 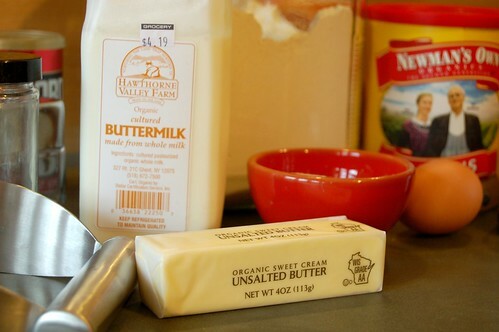 Add the butter and cut it in with a pastry blender until the mixture is the consistency of fine meal. Once at this point, use your hands to pinch and fluff the mixture. Add the raisins and caraway seeds and mix in with your hands to distribute. 3. 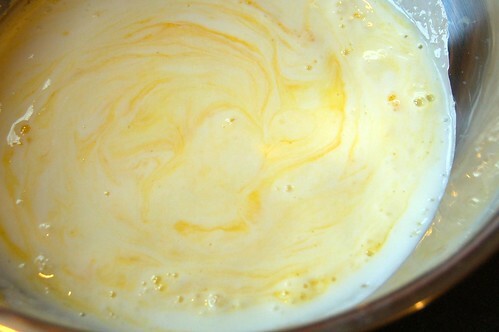 In another bowl, beat the egg with a fork, then stir in the buttermilk and baking soda. Make a well in the dry ingredients and pour in the wet ingredients. Stir with the fork until the mixture forms a damp dough. 4. Turn the dough out onto a lightly floured surface and coat the dough with flour on all sides. Knead with you hands a few times, then flatten into a disk about 8" across. 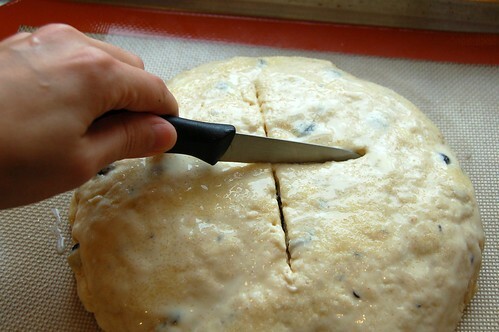 Place in the center of the prepared baking sheet and, with a floured sharp knife, cut a 1/2"-deep cross on top.